One of the things that China does better than Singapore in terms of F&B is that small businesses in China are allowed to flourish and thrive and perhaps even make mistakes and still survive whereas in Singapore, if small businesses take a tiny misstep, they will fall and disappear into the abyss of failure. In Singapore, it is hard for small businesses to have a second chance. 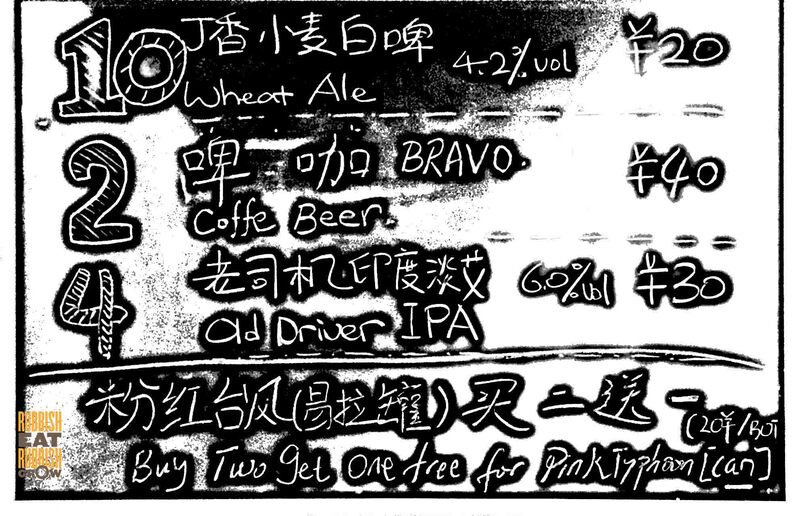 廿一芽精酿 21 Jag Craft Brew Pub is one of those small businesses in China that deserves our support. And apparently other people think so too. 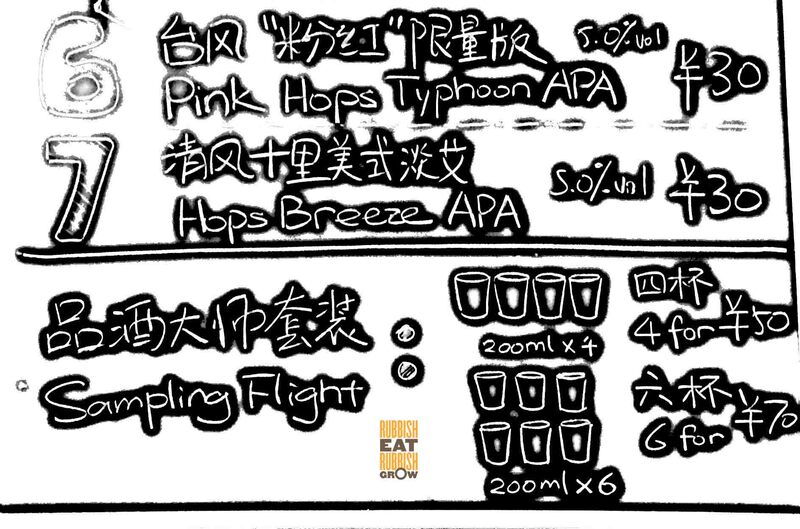 Their typhoon APA 台风美式淡艾 (¥30) has won awards. (In general, a pint of their beer goes from ¥20 to ¥40, which is quite pricy, considering that a big 1-litre bottle of beer goes for ¥8. And that’s why this bar is mostly patronised by expats. They have 9 types of home brews, and 2 come in bottles. They also have a sampling flight (4 glasses of any selection x 200ml, ¥50 or 6 glasses ¥70). I took the four glasses, trying four types of beer. The coffee beer 啤咖 Bravo (¥40) is very distinctive and super likeable for those who like to drink their coffee black. The coffee flavour is very potent, and I dare not drink too much for fear I couldn’t sleep. But it is also aromatic with depth. 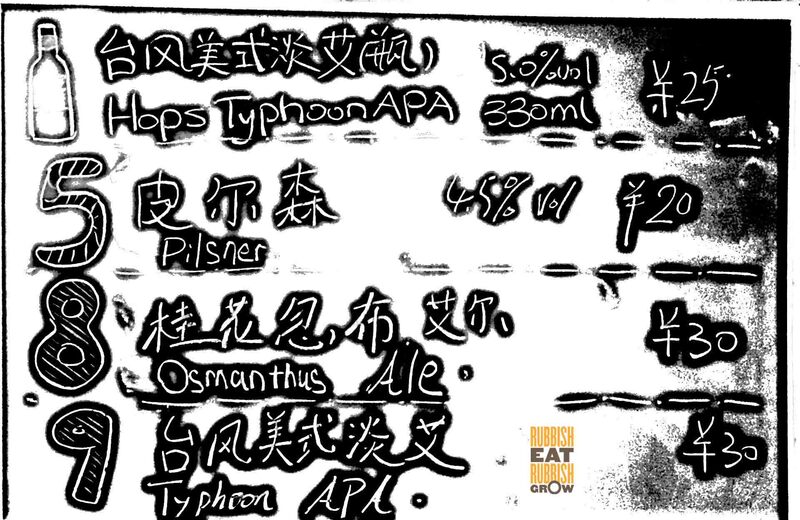 The typhoon APA, their award-winning beer, is what people would call well-balanced. It starts off by being sweet, transforms into a floral-ness, and then mellowed into a hop-py bitterness. My favourite is definitely without doubt the osmanthus ale 桂花忽布艾尔 (¥30). In China, cassia wine is the traditional alcohol for “reunion wine” on mid-autumn festival. And perhaps this beer is inspired by the wine. And I have not expected osmanthus flower to go so well with beer: very fragrant and sweet. For a true beer connoisseur, perhaps she or he won’t like this sweet beer which can be a little monotonous, but for me, I had much fun drinking it. The last beer I tried, Old Driver IPA 老司机印度淡艾 6% (¥30), lives up to its name. It really does taste like an old taxi. Initially, there is a taste of barley, which evolves into a cockroachy musky taste, which then transforms into a floral-ness, and finally into a extremely, extremely bitterness, almost like leather and the aftertaste of very effective Chinese herbal medicine. I can’t stand it, but I think it’s super interesting and fun. This place is so excellent that I have already visited it twice. I will probably visit it more since the beers are fantastic and the place is quiet, conducive to conversations. Maybe you already know this but 老司机 is actually a chinese meme.